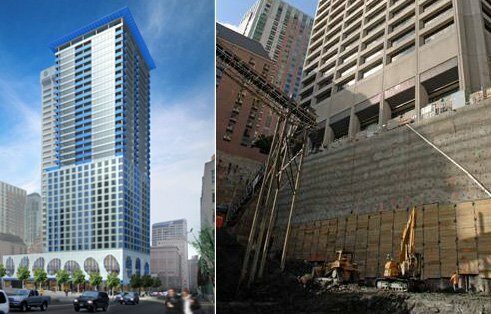 GeoEngineers provided geotechnical engineering services and seismic-design recommendations for this 39-story high rise. The tight site was bounded by existing structures, narrow alley and city streets. 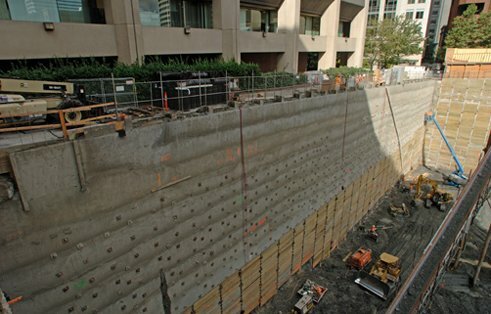 The hybrid west wall shoring system provides a new alternative for shoring in tight locations. Shoring on the west, north and east walls. 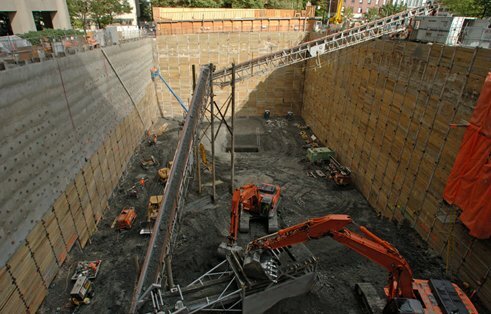 Overcoming challenging design constraints, GeoEngineers designed and modeled a unique combined shoring system to significantly reduce costs for a 39-story mixed use high-rise in downtown Seattle. Designing a shoring system consisting of soldier piles with soil nails in the upper portion of the excavation and tiebacks below the adjacent building in the lower portion. Modeling the wall performance using a 2-D finite element model carefully calibrated to specific site conditions. Seismic design of this tall building was also a challenge. GeoEngineers worked closely with the structural engineer to develop a series of site-specific response spectra and acceleration records based on documented past experience for input into their 3-D dynamic model. The high-rise, consisting of 170 upscale condominiums atop a 343-room luxury hotel, was completed in 2007. 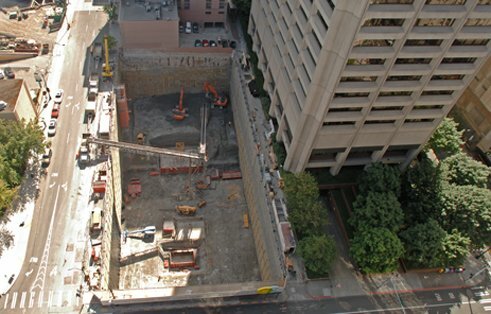 The owner estimated that the innovative shoring approach saved more than $1.5 million.